A family in Zambia stands before their farmland. The field has been planted with leguminous trees to replenish the soil with vital nutrients that will nurture future crops of corn. Berkeley - Trees, shrubs and rocks are helping tens of thousands of farmers in sub-Saharan Africa increase crop yields two- to four-fold, providing strong evidence that innovative soil fertility replenishment programs work and should be expanded, argues a University of California, Berkeley, researcher. In a policy article published March 15 in the journal Science, Pedro Sanchez, visiting professor at the Department of Environmental Science, Policy & Management at UC Berkeley's College of Natural Resources, said the high cost in Africa of commercial fertilizer has put it out of reach for most farmers. As a result, farmers have been unable to replenish nutrients depleted from the soil, which in turn becomes increasingly barren. In cases where the replenishment programs in sub-Saharan Africa have been used and proven effective, farmers are seeing significant rewards in higher crop yields. The programs involve the use of decaying vegetation and crushed rocks, which are mixed into the soil. "Farmers that have implemented these new soil fertility replenishment methods have seen crop yields increase two to four times," said Sanchez. "They tell us they are no longer hungry. And the best part of this is that they can utilize the natural resources that are all around them." Sanchez launched these programs 10 years ago to replenish nutrients in soil using resources naturally available in Africa. As the director-general of the International Center for Research in Agroforestry, he was responding to the desperate need to provide local farmers with a means to restore the agricultural health of their land. Since these programs began, news of the replenishment techniques has been spreading among individual farmers and through community outreach efforts by non-governmental organizations, national research institutes and universities. Scaling up these "low-tech" technologies to reach tens of millions of farm families throughout Africa would cost an estimated $100 million per year for the next decade, or 10 percent of the annual investment suggested for overcoming hunger and malnutrition in Africa, said Sanchez. "For so long there has been a lack of government priority to the rural sector," said Sanchez. "Government officials have put so much focus on other important issues, such as the AIDS epidemic, debt relief and increasing foreign investment, that they have neglected the agricultural sector, which engages 70 percent of all the residents in Africa." Low crop yields present one of the most fundamental barriers to the ability of many African countries to feed its own people. Sub-Saharan Africa remains the only region in the world where per capita food production has remained stagnant over the past 40 years, said Sanchez, who is also a senior research fellow at UC Berkeley's Center for Sustainable Resource Development. "Even without adjusting for local income, fertilizers in Africa cost two to six times more than in Europe, North America or Asia," said Sanchez. For example, a metric ton of urea, a form of nitrogen fertilizer, costs $120 to $770 in various parts of Africa compared with $90 in Europe. Soil depleted of its nitrogen and phosphorus has also limited the potential of improved crops varieties that have been planted in Africa compared with regions in Asia, Latin America and the Middle East, according to a 2001 report by a group of international agricultural researchers. Sanchez pointed to the lack of a strong infrastructure, such as poor roads, that jacks up the cost of delivering commercial fertilizer to rural areas in Africa. Reducing the cost of commercial fertilizer must be a high priority, but there are options farmers can take in the meantime to replenish the soil's fertility, said Sanchez. Over the past decade, close to 100,000 farm families in Eastern and Southern Africa have tested new methods of enriching nutrient-poor farmland. They found that by interplanting seedlings of various leguminous trees with a young maize crop, about 150,000 acres of farmland accumulated 100 to 200 pounds of nitrogen per acre over a period of six months to two years. The method works by planting the seedlings early in the rainy season while the maize is still young. The trees grow very slowly, so they do not compete with the crop. After farmers harvest the corn, they leave the trees to grow during the dry season. At the end of the dry season and before the next planting of corn, farmers cut down the trees, leaving the stems, leaves and roots to decompose and release the accumulated nitrates into the soil. "Legumes are the only family of plants that can take inert nitrogen from the air and convert it into nitrates, a form plants can use," said Sanchez. He said they use leguminous trees that are native to Africa, such as sesbania, because they grow quickly and can convert large quantities of atmospheric nitrogen. Increasing the use of trees in farming can also have the added benefit of removing large quantities of carbon dioxide from the atmosphere, thus tempering the impact of global warming, said Sanchez. Another method of replenishing soil fertility applies to East Africa where the soil is particularly low in phosphorus, another nutrient necessary in farming, said Sanchez. "We found plentiful supplies of indigenous rock phosphates throughout East and Southern Africa," he said. "In one deposit in Northern Tanzania, we found enough to replenish the phosphorus-deficient soils of Kenya, Uganda and Tanzania for decades." The rock phosphates found near the surface of the land are crushed and worked into the soil, releasing their nutrients over the course of at least five years as they dissolve in the slightly acidic soil of East Africa. "More than 10,000 farms in East Africa have used this technique successfully," said Sanchez. A third method tested by African farmers involves planting pieces of the Mexican sunflower shrub, Tithonia diversifolia, in the same planting holes as the crop. The shrub was introduced along with corn into Africa hundreds of years ago and is now plentiful along roadsides and field boundaries. The shrub accumulates large quantities of nutrients from the soil. The shrub's leaves release phosphorous, potassium, nitrogen and micronutrients as it decomposes. Sanchez noted that these soil fertility replenishment methods are not ideal for all areas in sub-Saharan Africa. 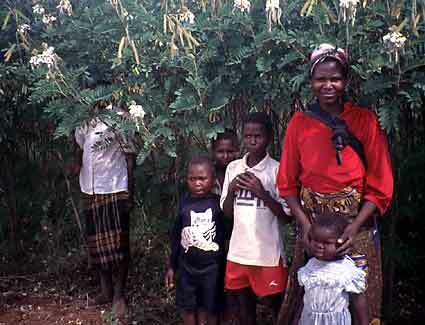 The semiarid tropics of Africa have a much longer dry season, which limits the benefits of leguminous trees. At present, there is no established market to bring high quality rock phosphates to the farmers that need them, though that has been changing in recent years. And while the Mexican sunflower shrub is plentiful, cutting and carrying it to the fields is labor intensive and would only be worthwhile for high-value vegetable crops, such as tomatoes and onions. The use of these organic fertilizers would not eliminate the need for commercial fertilizers, said Sanchez. Policies are needed to reduce the high cost African farmers pay for commercial mineral fertilizers, he said. "The farmland in sub-Saharan Africa is in such dire need of help that we need to do as much as possible to make it fertile," said Sanchez. "Increasing crop yields will help alleviate the hunger and malnutrition that is so pervasive in Africa, and it would go a long way towards improving the general health of the people there."